Those of you who have played the previous adventure “Lifeboat”, by the same author, will no doubt find that the first location is familiar. 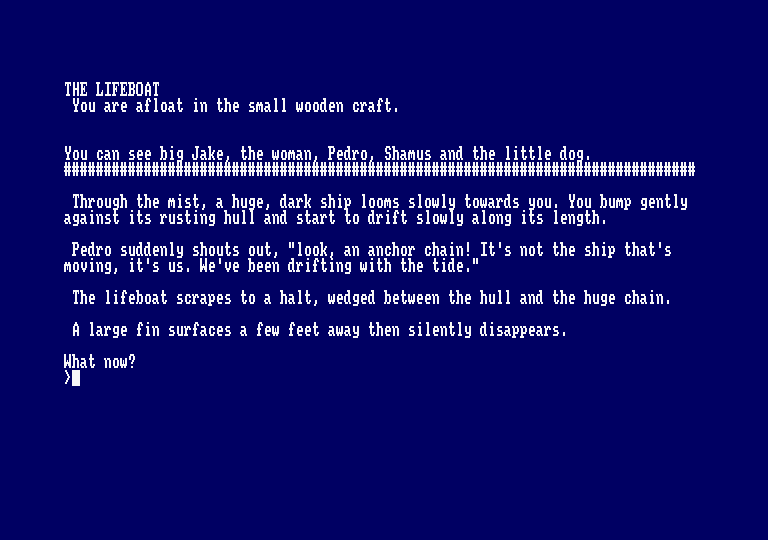 For those of you who have not played "Lifeboat", I will explain. On the 11 August 1827, the clipper "Allana” was lost at sea with only five human survivors and a small black mongrel dog. "Lifeboat” was based on the first few days which followed the disaster. 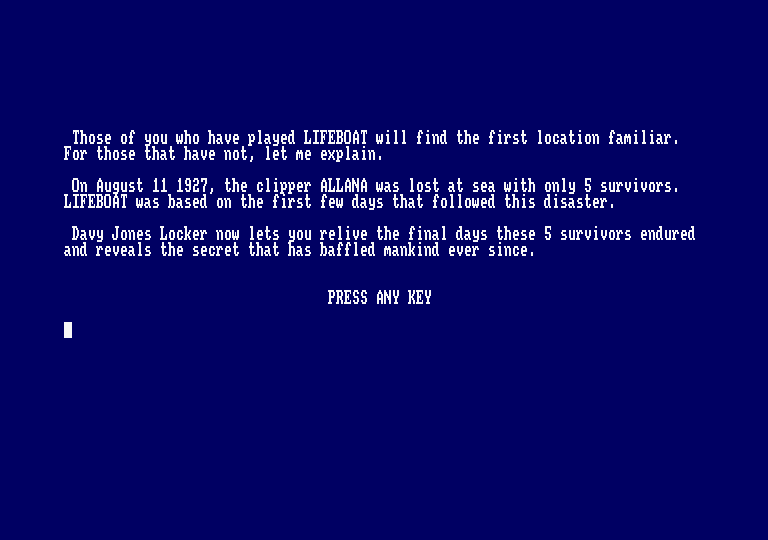 “Davy Jones Locker” now lets you relive the first few days that those survivors endured and it reveals the secrets that have baffled mankind ever since. Now is your chance to attempt to find the secrets of Davy Jones Locker. You are, of course one of the people afloat in the small wooden lifeboat with Big Jake, the woman, Pedro, Shamus and the little dog. No land in sight in any direction, only mist. Through the mist a huge dark shape of a ship floats slowly towards you and your lifeboat bumps gently against the large hull and drifts gently along its length. Pedro suddenly shouts out, "Look, an anchor chain! It's not the ship that's moving but us. We've been slowly drifting along with the tide”. The lifeboat suddenly scrapes to a halt wedged between the hull and the huge chain. A large fin surfaces a few feet away and then finally disappears. Everyone wants to be rescued first, you let them all climb the chain, leaving you and the little dog behind. When the last one has gone before you and disappears from sight, several piercing screams shatter the silence. You look up but see nothing. only section which Is still Intact. There is no sign of anyone about at all, which is just as well because you stand there in your “birthday suit”, not that you would worry at all in your present predicament. You can see a grappling hook attached to a huge coil of rope near at hand. I suppose that one of the best things that you can do is throw the grappling hook overboard and see if you can drag anything from the bottom of the ocean. You might find an old sock or an old bike or something of the like. 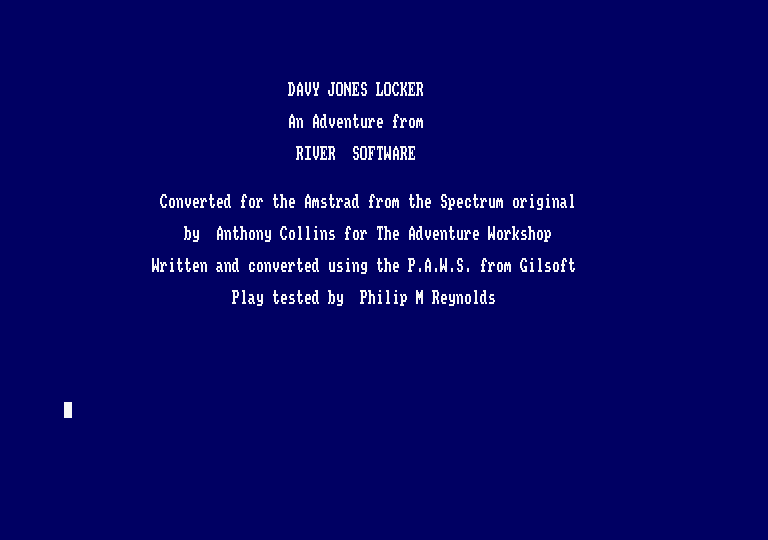 You never know until you try - so get cracking and explore the depths of "DAVY JONES LOCKER".